Metro Market? Out in Front or Behind the Magic 8-Ball? Ready to predict the future? There are lots of ways from “educated guesses” to hard-core data crunching. For fun, we love the ubiquitous “Magic 8-Ball” for all its unpredictable and often humerous answers; with our all time favorite responses being “Reply hazy try again” and the classic “Ask again later”. In reality, we rely on entrenched experience, serious analysis, and data review. So when it comes to observing our major metro real estate market we look to the pros. We are pleased to share some of the data we rely on when setting trends for the year. azarchitecture/Jarson & Jarson Real Estate proudly present the Metro Phoenix Economic Snapshot for Mid-Year 2017. 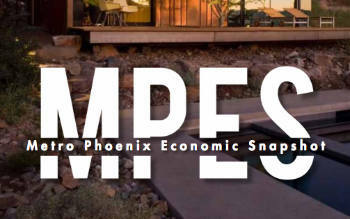 Our report features studies by two of the Valley’s leading real estate analysts, Elliot Pollock of Elliot D. Pollock & Company and Mike Orr of the Cromford Report. Both are leading firms that have successfully tracked and observed our market with keen success. We think you’ll enjoy having a copy of this report. You may also opt-in here for regular updates. Overall, we are enjoying a strongly balanced market with a few outstanding bright spots coupled with softer demand in some particular areas and segments. From our perspective, we are in a normal and healthy market that should stay steady for the remainder of the year (be sure to read the Metro Phoenix Economic Snapshot for much more detail to this summary). If you ever have specific and/or personal questions on market timing, trends and values, we hope you’ll remember to call on us as a trusted advisor. We are here to help!